"How to be a Jew After the Nakba". 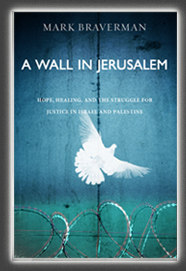 Read Reviews of A Wall in Jerusalem on Electronic Intifada and by British blogger Robert Cohen Read the Christian Century review of Rashid Khalidi's Brokers of Deceit. Watch Mark Braverman's book reading and lecture in Raleigh, NC on C-Span's Book TV from Friday, May 14 2010. Mark Braverman’s roots are in the Holy Land – his grandfather, a fifth generation Palestinian Jew, was born in Jerusalem, emigrating the U.S. as a young man. Growing up in the United States, Mark was reared in the Jewish tradition, studying Bible, Hebrew literature, and Jewish history. Trained in clinical psychology and crisis management, Braverman devoted his professional career to working with groups and individuals undergoing traumatic stress. Returning to the Holy Land in 2006, he was transformed by witnessing the occupation of Palestine and by encounters with peace activists and civil society leaders from the Muslim, Christian and Jewish communities. Since then, Mark has devoted himself full-time to the Israel/Palestine conflict. He is a co-founder of Friends of Tent of Nations North America, a nonprofit dedicated to supporting Palestinian land rights and peaceful coexistence in historic Palestine. He serves on the advisory committee of Friends of Sabeel North America and as a consultant to Evangelicals for Middle East Understanding. Mark has been closely involved in the growth of the international church movement to support the cause of Palestinian rights. In 2009 he participated in the launch of the Kairos Palestine document in Bethlehem. He is Program Director for Kairos USA, a movement to unify and mobilize American Christians to take a prophetic stance for a just peace in Israel and Palestine.